Avoiding a kitchen fire is easier than you think! More often than not, a fire is started in a kitchen of an apartment or office building. In fact, kitchen fires are one of the leading causes of fires in the nation. 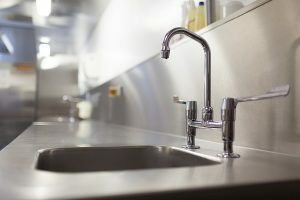 As a result, it is imperative to take proactive steps towards ensuring that a kitchen fire does not affect your office or apartment building from going up in flames and becoming destroyed. Here are some extremely helpful tips that you can use to prevent a fire from harming your apartment or office building today. Grease fires are often the worst fires that occur in apartments and offices alike. In fact, due to the high occupancy of both, fires that happen in these buildings typically grow rapidly resulting in a massive disaster. Cooking in a kitchen where there is grease requires extra caution. Therefore, simply rolling up your sleeves or wearing short sleeves while cooking in the kitchen with grease will ensure that no loose clothing catches fire. A critical component of fire prevention in kitchens is to be extremely vigilant of any fire hazards. In fact, whenever you are using a stovetop in your kitchen it is important to monitor it. Furthermore, even if you need to leave to go to the restroom, turn your stovetop off. A fire can erupt within a second, turning your back on the stovetop could result in severe consequences. Therefore, it is very important that you make sure to stay close to the stovetop whenever it is in use. Pan On Fire? What Do You Do? In the rare instance that your pan ignites, it is crucial that you immediately turn the stove off. In fact, you will want to place the lid on it and then immediately put it out using your fire extinguisher. In addition, you can use baking soda to help suppress the fire if you need to. However, if the fire is a grease fire it is imperative that you avoid using water to put it out. This can be severely detrimental. Therefore, ideally, you will want to be extremely vigilant when cooking in your kitchen. This entry was posted on Thursday, April 20th, 2017 at 11:09 am. Both comments and pings are currently closed.